My cuticles tend to get very dry, I saw this on sale for $3.99 CAN at Rexall. It supposedly is being discontinued which I'm not sure about but I decided to try it out anyways. fast-absorbing gel formula that nourishes dry, ragged cuticles and it leaves no color. It's a orange color gel with little beads of Vitamin E & Botanical Extracts. Its a light weight gel that is easy to use. The doe foot applicator makes it very easy to apply and smooth out. You can see the beads start to break as you apply it. I love the smell of this, it smells orange peels. After applying it with the applicator I massage it in with my fingers. This has made my cuticles much more smooth and healthier. I tried this on my husbands cuticles since he has very thick cuticles sometimes, and this worked to soften them up and left them feeling smooth. The only thing about this product is that a little goes a long way, and I've found that within only a couple of uses the gel easily is used up. I'm hoping that this product is not discontinued. I definitely need to pick up more of this. 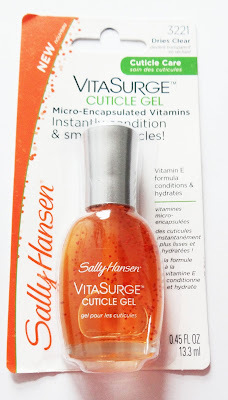 There are other gels in this Vita Surge line and I hoping to try the Strength Gel since sometimes my nails do tend to be weak and break. Beauty blogger who is a makeup and beauty enthusist! Revlon Colorburst Matte Balm In Sultry: Review & Swatches! Benefit Gettin' Cheeky: Review & Swatches! Maybelline Fit Me Stick Foundation: Review & Swatches!